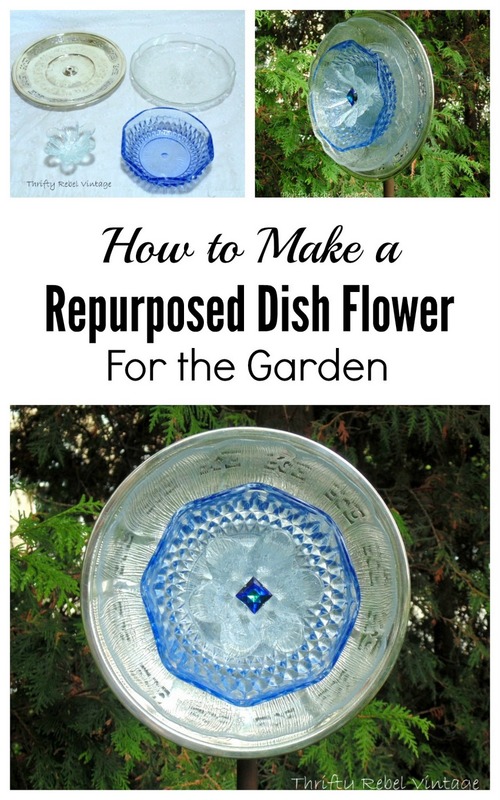 It’s so easy to make a beautiful garden dish flower for your garden. The most difficult part is finding the pieces, and I find everything I use at thrift stores, garage sales etc. This way it’s also very inexpensive. Once you have some pieces that you’d like putting your dish flower together is pretty straight forward. 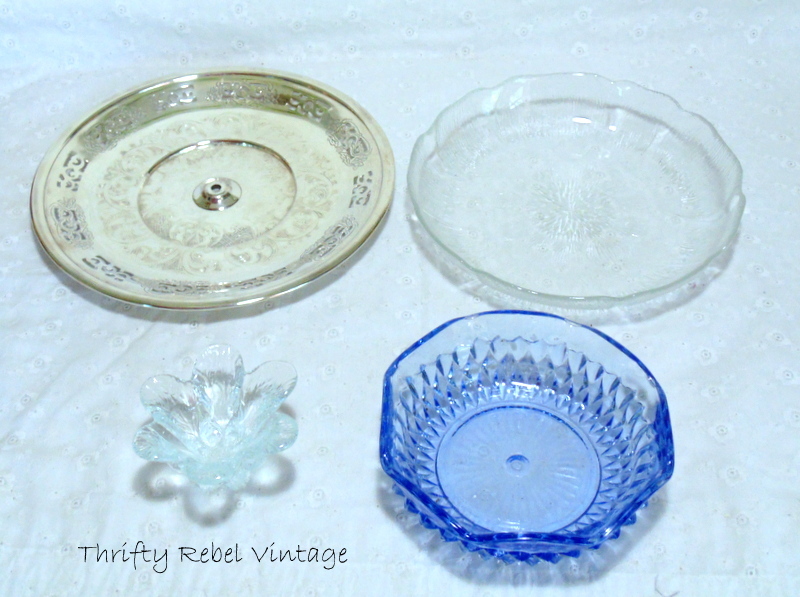 For this dish flower I’m using a vintage 9″ silver plate tray bottom from a tiered stand, a large but low glass bowl, a blue decorative bowl, and a flower shaped candle holder. I put it together inside because it was way too hot outside. First the glass bowl gets glued on. 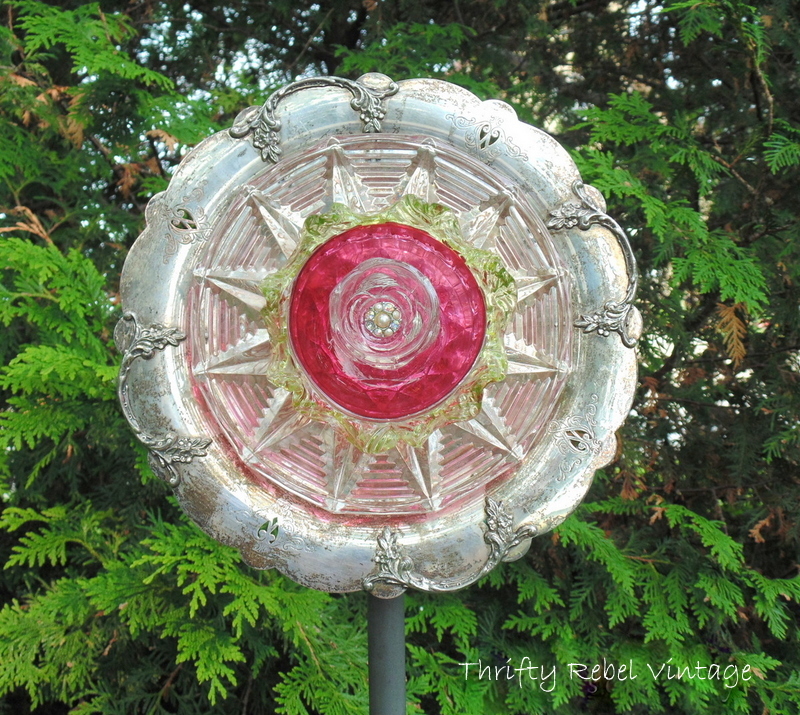 The reason I use a silver plate piece as the back is that it adds shimmer and it also helps keep the whole flower from breaking if it ever falls over in the wind. 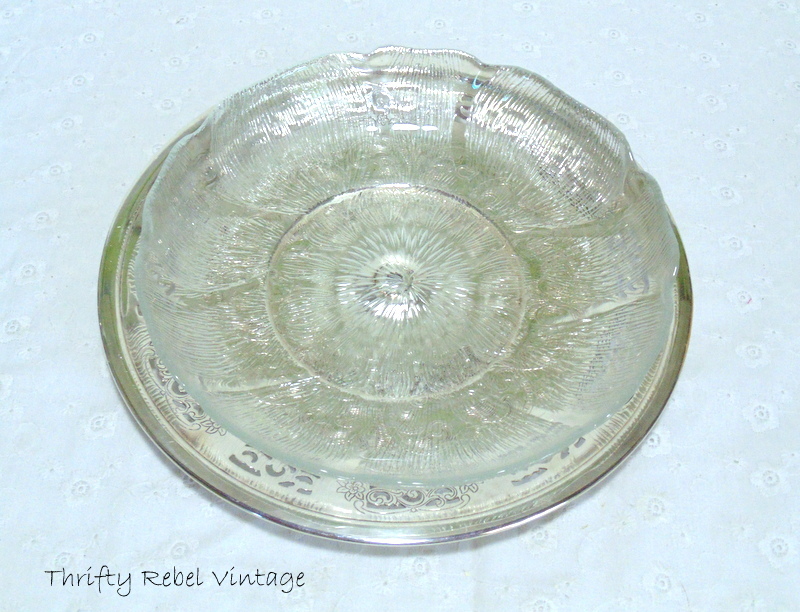 Plus I love the combo of glass and silver plate pieces. They seem to make each other sparkle. Always apply the glue to the raised parts of the bottom of each piece or they won’t adhere well if at all. Hopefully you can see in this pic that the glue is applied to the raised outside edge of the bottom. Once each piece is down just wiggle it in place a bit to make sure there’s a good connection between the pieces. 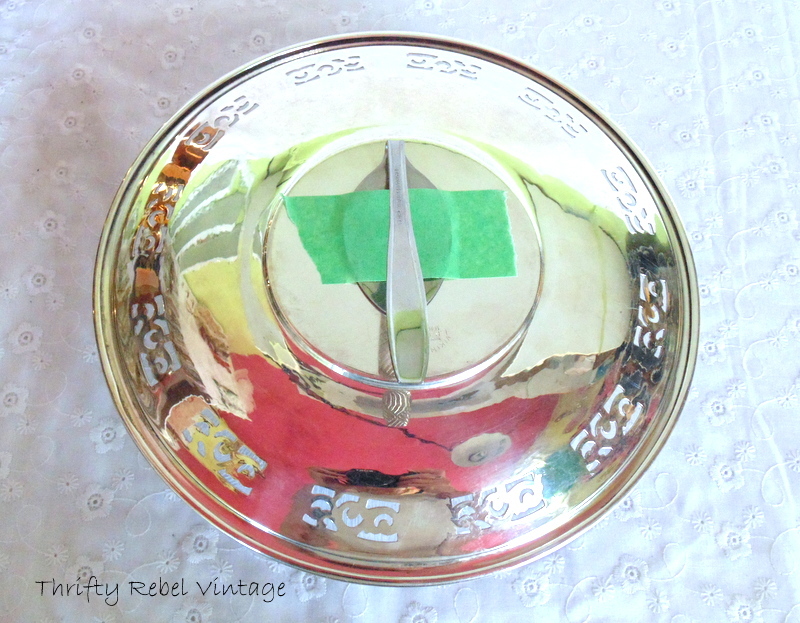 The candle holder also had raised parts on its bottom so that is where the glue was applied. And again wiggle a bit once put in place. 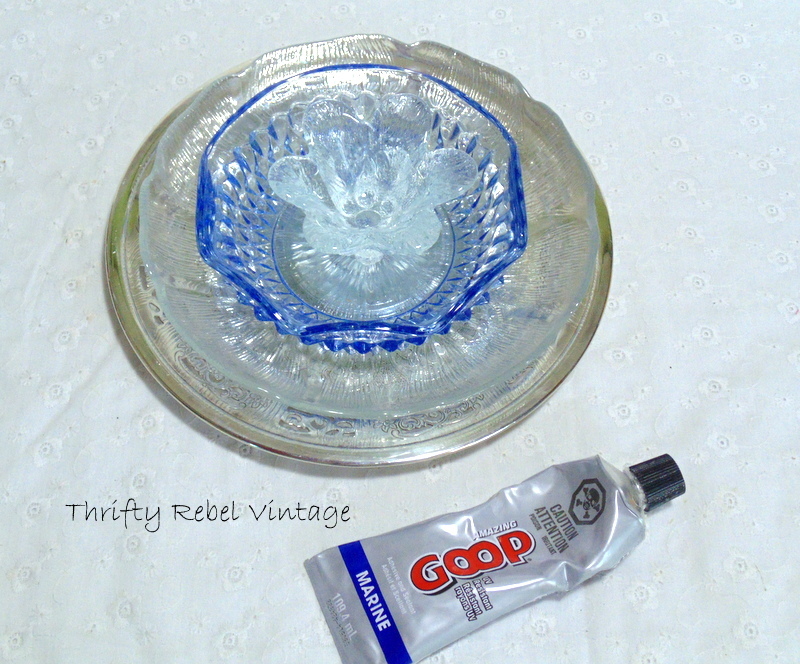 Here’s the glue I used Marine GOOP adhesive . It’s used in boat repair and is UV and water resistant. I’ve heard that E6000 works well also, but I’ve never used it for outdoor projects. Once the dish flower is all together I head to my stash to see what I can add for the centre, which often makes the whole flower. 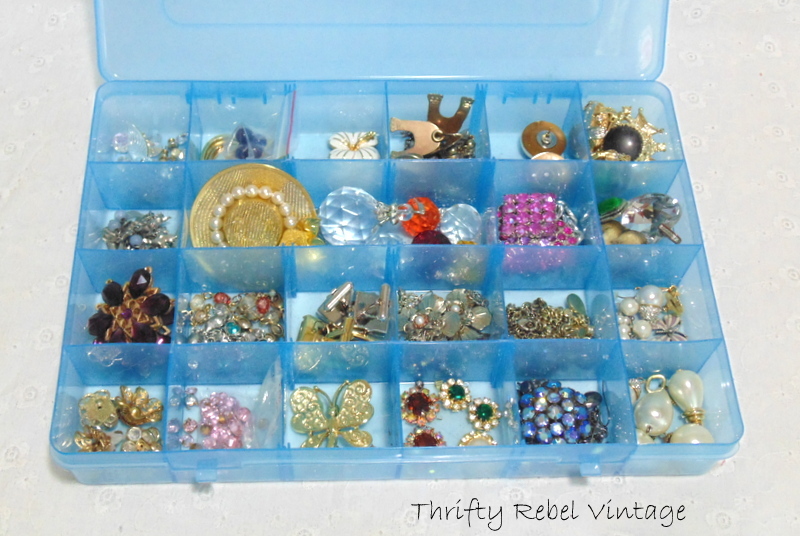 This is one of my many storage containers of thrifted bling. Tape all the pieces with painters tape for about 30 minutes so they don’t move. Believe me that can happen. 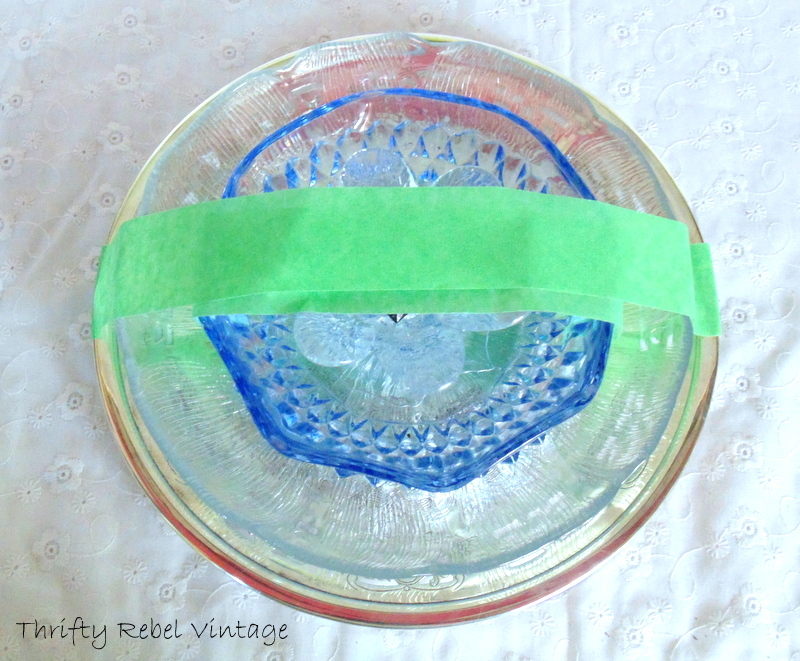 Remove the tape, and let your dish flower cure for about 24 hours in a cool place. This is important, the glue won’t cure properly in hot and/or humid conditions. Stainless steel tablespoons work well for hanging. I find them for 10 cents each at my local thrift store. The spoon should be flattened with a regular hammer and then bent like above. Then it’s glued to the back of the dish flower. Decide where the top of you dish flower will be at the front and glue the spoon accordingly on the back. Tape the spoon in place and let it cure for about 24 hours. It needs to be fully cured before you place it into the pipe to display in the garden. Before you glue the spoon make sure the end is not too wide for whatever pipe you’re going to use. I use 1/2″ or 3/4″ copper pipe, but any pipe you have around will work. Just make sure your spoon handle will fit. Once your dish flower is cured place the spoon into the pipe, which should be inserted into the ground about 10-12″ to give it strength on windy days. For the centre I used a blue irredescent cufflink. When picking pieces for your dish flowers take into account what it will look like from the sides. 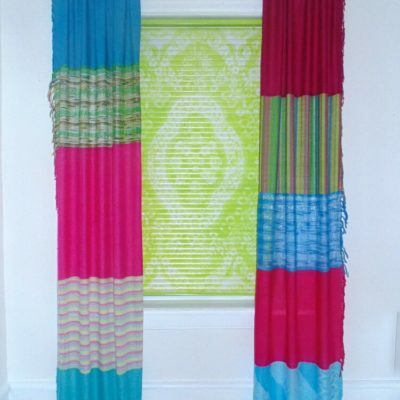 And just to show you that the possibilities are really endless, here are a few examples of others I’ve made. These flowers were made exactly the same way. It’s just the pieces used to create them that were different. If you have cold and snowy winters dish flowers should be safely stored out of the elements to keep them looking good. 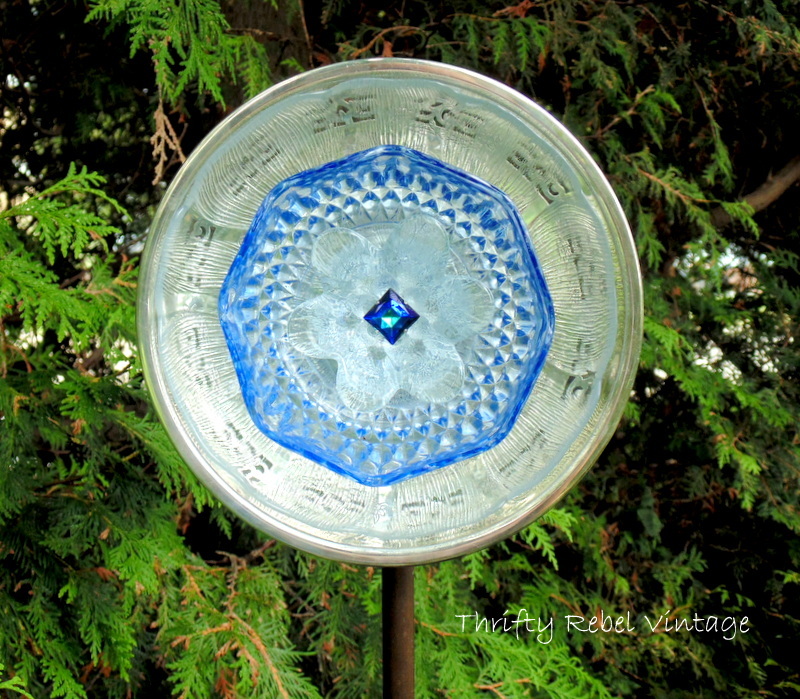 And please know that the silver plate pieces will age, but to me that just adds to the overall beauty of each flower. 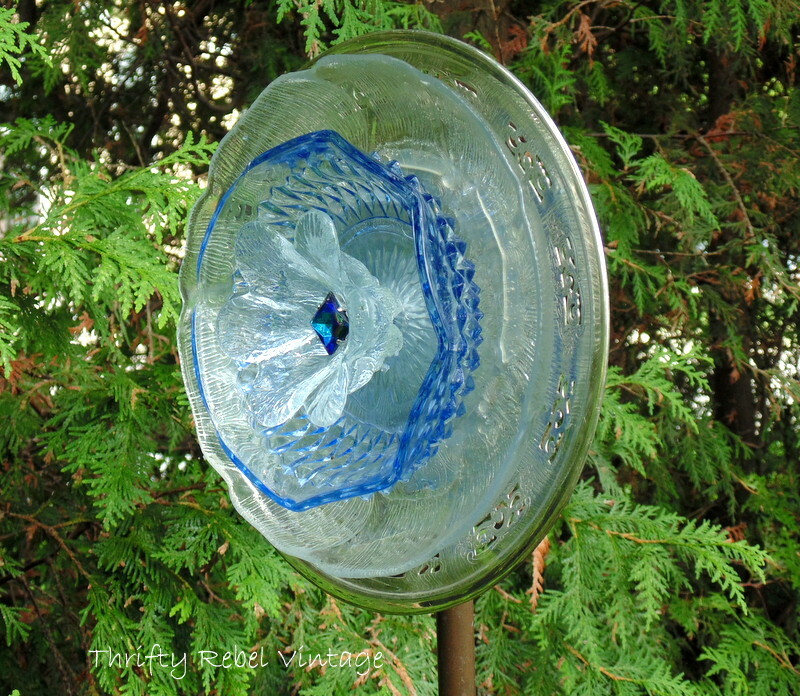 Now that you see how easy it is I hope you’ll make one to decorate your own garden. 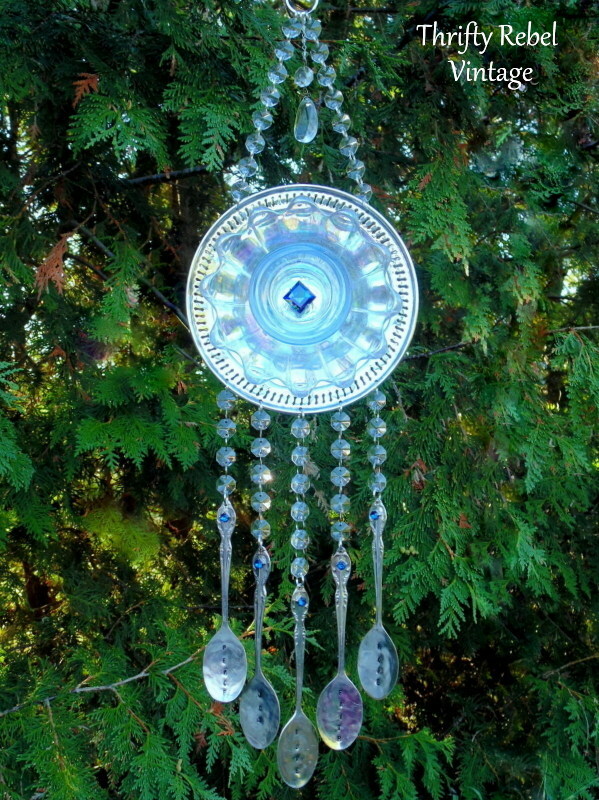 By making a smaller version you can create a garden plate flower wind chime like mine pictured above. 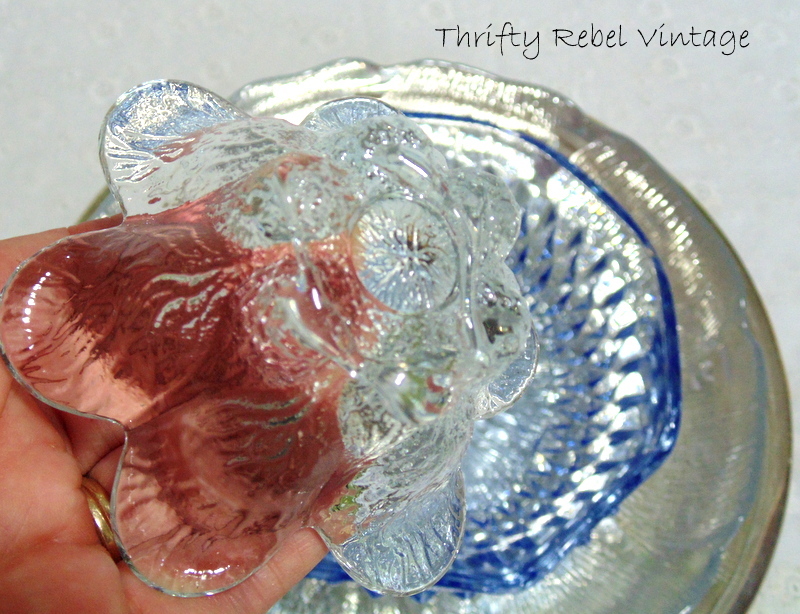 Also, check out how I made these steamer strainer flowers. 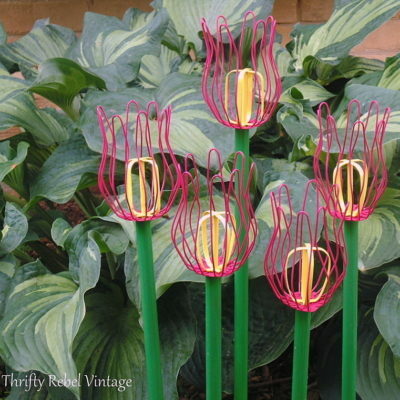 Here are some other garden art flower projects I think you might enjoy. Your directions are so easy to follow that I will have to make one of these as a gift for someone! I don’t need to make one for myself now that I have the pretty red one coming to me. So happy to be the winner of it!! Fantastic….you solved my problem of how to keep them upright. I have made several but they kept falling off the stands I tried. I now have the solution…thanks so much. I love the pieces you make! Great gift ideas ! Thanks very much Diane! I’ve given a few as gifts myself. Sooooo beautiful Tuula. 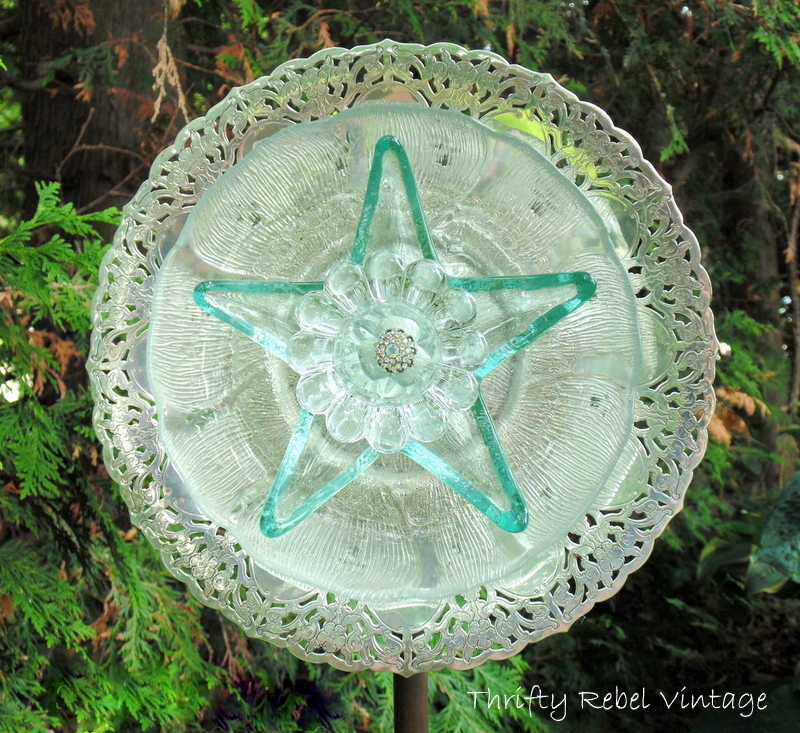 I love the star dish. Gorgeous. I think these make wonderful additions to the garden. So pretty. I used GE Silicone II as recommended in many sites on Pinterest. Unfortunately even with 3 days curing, the Florida heat melted the silicone and one by one, my flowers were on the ground, soft enough not to break a one. I had to resort to drilling each piece instead, and I use PVC T’s on the back of the plates 3/4 inch that fit right on heavy PVC 3/4 inch for stems. I’ve never had that problem Christine, but then again I live in Ontario Canada and I take my flowers in for the witner. 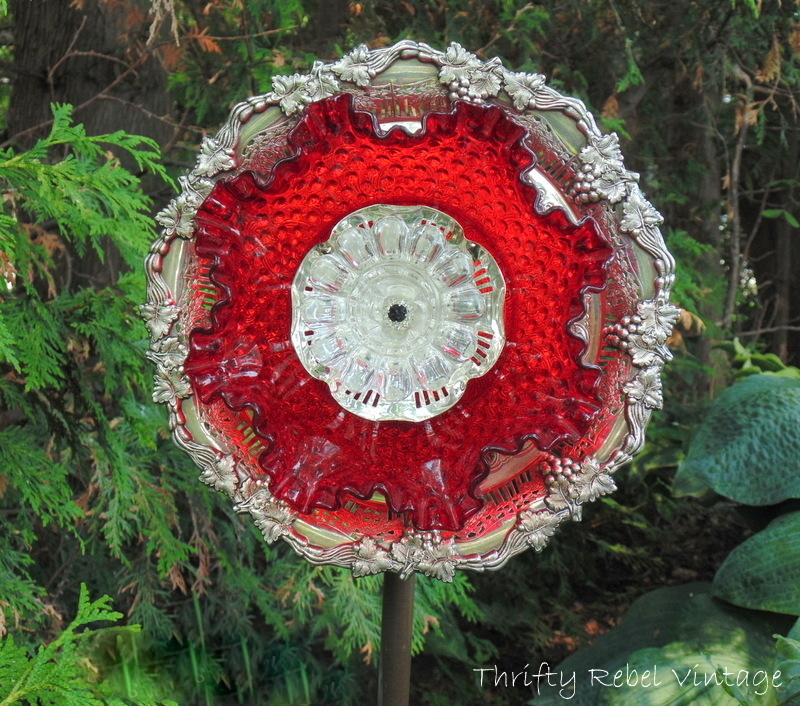 I’ve drilled some dish flowers together too, and it definitely works well. PVC is a great idea. What a GREAT project Tuula! You are so creative my friend! All of these are beautiful. Your glass garden flowers are just gorgeous, Tuula. 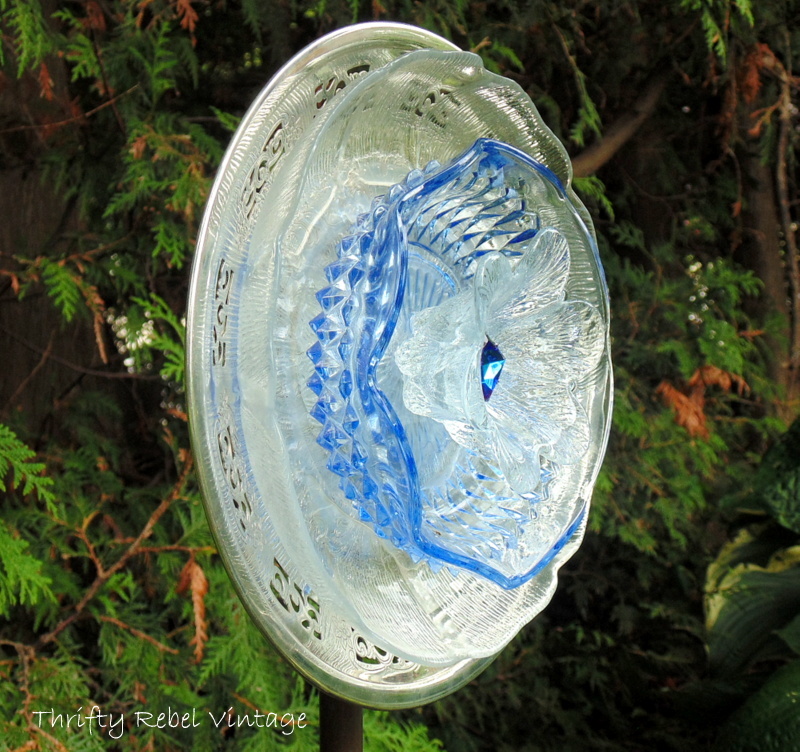 Mom has been looking for just the right pieces to make some of these for a very long time. If we had unlimited funds, we could just buy them at Goodwill, but they want too much for their brightly colored glass, so the hunt continues. Lovely garden art! Thank you for sharing your tutorial! You’re so welcome Kelly! I hope you make one for yourself some time. Thanks so much for the idea of the spoon. I have been glueing bottles to the back of mine…but the spoon would take up less room when storing. Love all your plates. I lucked out yesterday….was traveling and saw a Goodwill store in Harrisonburg, Va and they had bud vases 4/$1.00 and then I found glasses, plates, bowls 5/$1.00. Needless to say, I was a happy person by the time I left there!! Great tutorial. Thank You so very much. What a great idea on use of an old spoon. 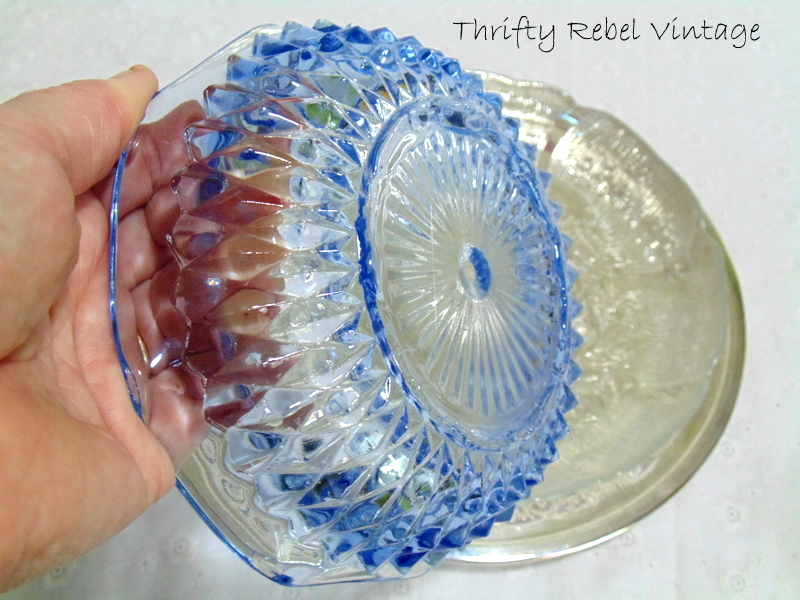 Only problem I would have is using such a pretty bowl like the blue and red one that you had used. Have been searching for that Marine Good that you use but no such luck in finding it here. Have looked at Home Depot, WalMart, and Michaels and seems none of them carry it here in my area. Next search will be at Lowe’s and Hobby Lobby along with a hardware store that isn’t too far away. I don’t order on line so will search locally till I find it and hopefully someone will have it. Once again, thanks for sharing your tutorial. These are so pretty. Visiting from Funky Junk. Thanks Cheryl! I appreciate you stopping by. So pretty… every one of them! Loved the garden flowers. I purchased two of these from a local flower and garden shop and paid $25.00 for them. Now that I have your instructions I can make my own. I have seen a photo of aside of a outside shed that had flowers that you made and used garden hose as the stems, can you post that again. Hi Keri. That isn’t a project that I’ve done myself. 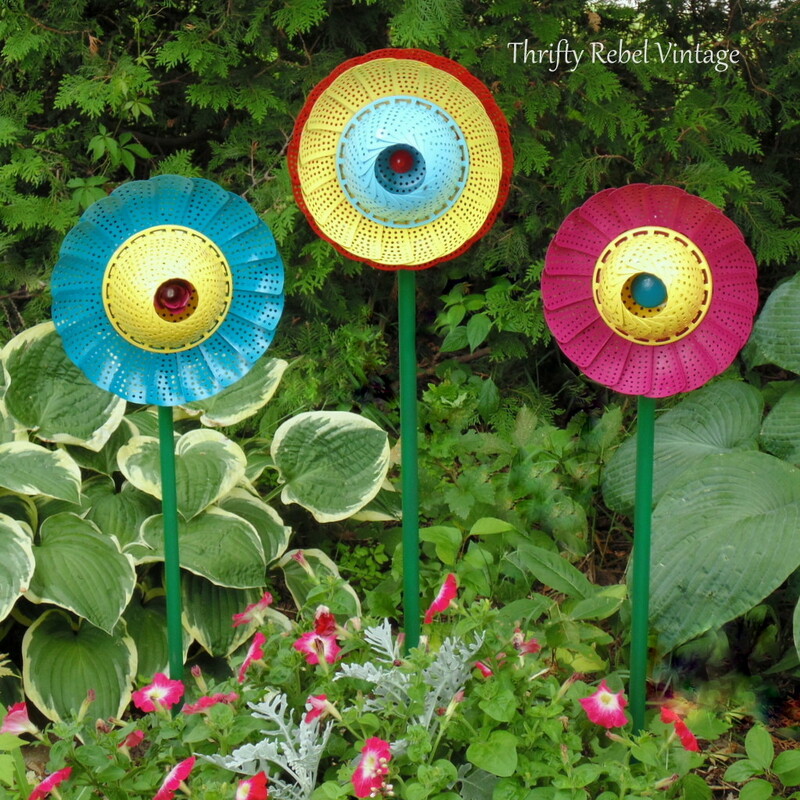 I believe my garden plate flowers that I posted a few years ago were featured on a couple of sites with some other garden art projects from other sources and that was one of them. It is a fantastic idea, and one I would like to try… maybe next summer. If I do I’ll definitely be posting a how to… with credit to the original creator of course. Thanks Mimi! I love that dish or plate flowers bloom for me for my three gardening seasons. It helps add some fun and colour to the gardens. Hi Laura. I’m so glad my project has inspired you. Here in midwestern Ontario, Canada, we get cold and snowy winters so I never leave my plate flowers out because they’ll just be buried in snow… so I can’t say for sure how the glue would hold up in your weather. 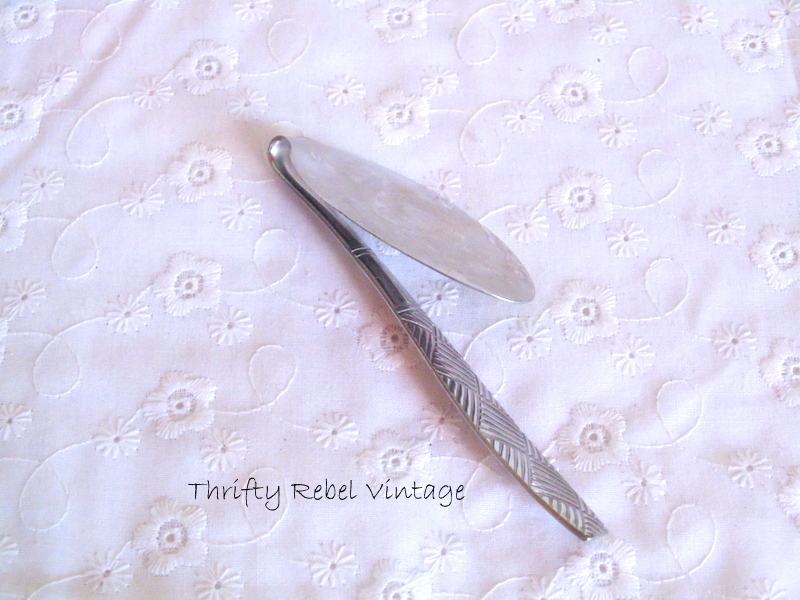 I would do a test one with inexpensive thrifted pieces and leave that one out and see how it holds. You can make others that you care about more, and if it goes OK then you can leave them all out next winter. I hope that helps. Thanks so much for stopping by. Thank you so much for sharing your art. It is amazing and I love each and everyone. I just retired and I have been collecting glass for a while so now I have time to hopefully create something I will like as much as I like your creations. Your instructions are so helpful. I am a new crafter and I hope I can do well. Is there a glue beside the Marine Adhesive you use for outside creations? Thanks Bev! You live in such a beautiful state, and I hear you about long winters. We have them here in Ontario too. 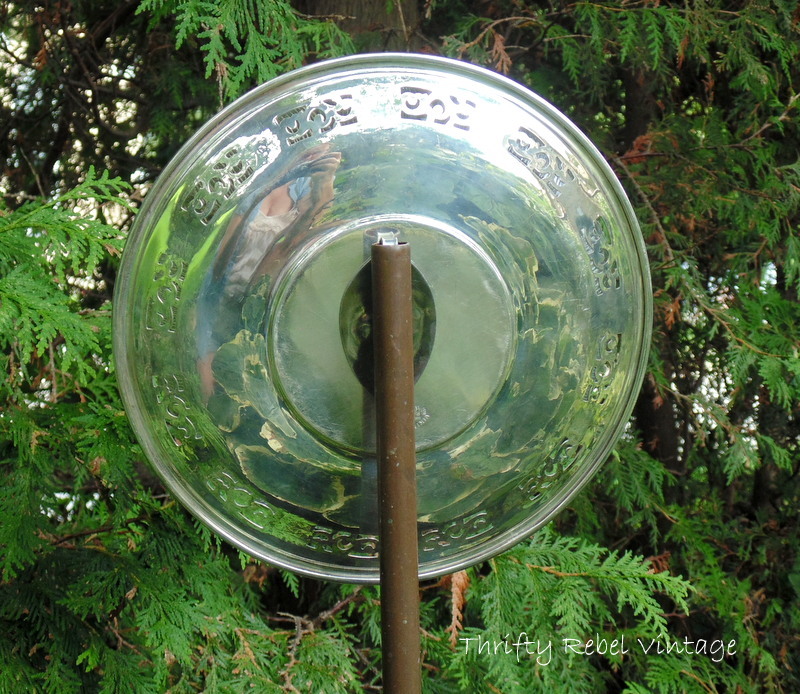 How do i keep silver or copper plates from tarnishing or getting rusty, I had one before and was a through away. Tuula! You are a genius! Love all you create. Thanks for the inspiration. I think your flowers are the prettiest I have seen on the web. They are so artistic and classy. I notice that a couple have holes in the middle. What is your opinion of drilling holes and attaching them with bolts and washers? Is there a limit to the number of plates due to weight? I’m worried that mine will fall apart as a couple have 5 plates! They are for my hosta bed so they have to be pretty high. Would this work using some parts plastic, so they wouldn’t be so heavy? Does your glue ever fail? I made several and used the E6000 glue, and they fell apart. 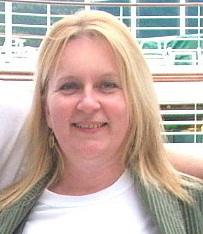 Hi Debbie. The parts of this flower are attached using glue. There is no hole required.